Has anyone else found the camera roll on their phone filled with pictures like this? For some reason, this one reminds me of that Bat Boy picture they used to put on the cover of The National Enquirer. And here's the Crazy Eyes. She must have been singing in this one. A close up of the singing. No cavities! If you were at Sam's this weekend, you may or may not have seen one similar to this as the wallpaper on one of the display iPad's. And in closing, all of these mug shots reminded me of this little blast from the past. She and the babysitter used to come to work with me when I worked in downtown Tulsa (yes, I had the best boss in the entire world, oh and my current boss comes in at a close 2nd). 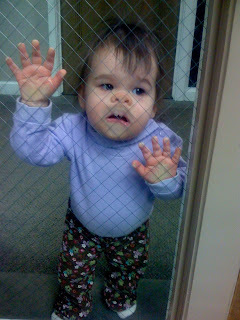 She liked to come around and visit me and my co-workers throughout the day and press her face against my office window. This still makes me crack up. Enjoy your Monday everybody! She'll love me for this someday.